The world’s greatest adventurers have a lot in common. Meticulous preparation, determination, and careful use of available resources. This is why we are not the world’s greatest adventurers. We had all agreed that this trip would not be the fustercluck that was the original Wrong Way Round debacle. For starters we could not repeat the impromptu stunt show at our leaving party. Assen race circuit is still strewn with pieces of indicator lenses, brake levers and the entire contents of Nick’s garden allotment. If you are not familiar with the first Wrong Way Round trip that last bit won’t make any sense. Never fear, making no sense is a common theme here. The net result was that A NEW RULE was introduced for this event, giving us a grand total of one rule. It was declared that since this year’s leaving party was in the UK, at the Silverstone Moto GP, we wouldn’t need to take the bikes. We could just pick them up afterwards on the way back. Thus, this would save them from pre-trip destruction through over-enthusiastic behaviour. Kaspars, our Latvian comrade, would not be joining us until after the leaving party. A rookie error since it was left to the rest of us to “prepare” his bike. Preparations consisted of gathering up all the awful spares we’d decided weren’t good enough for our own bikes, and bolting them together to make an even more awful bike. Charles decided the bike should not only be awful, but embarrassing as well. But seriously, how do you embarrass someone who is already riding a Yamaha Townmate? Charles with a knowing wink said he had something in mind. “Think pink” he said. “Pink? Hang on, didn’t the SAS used to paint their Land Rovers pink as desert camouflage“. “Well it will hardly be embarrassing to ride a bike that is invisible!“. Charles strutted off to the garage with airbrush in one hand, roll up hanging from mouth and a can of Stella in the other….hang on. No Stella can! Blimey he was serious. 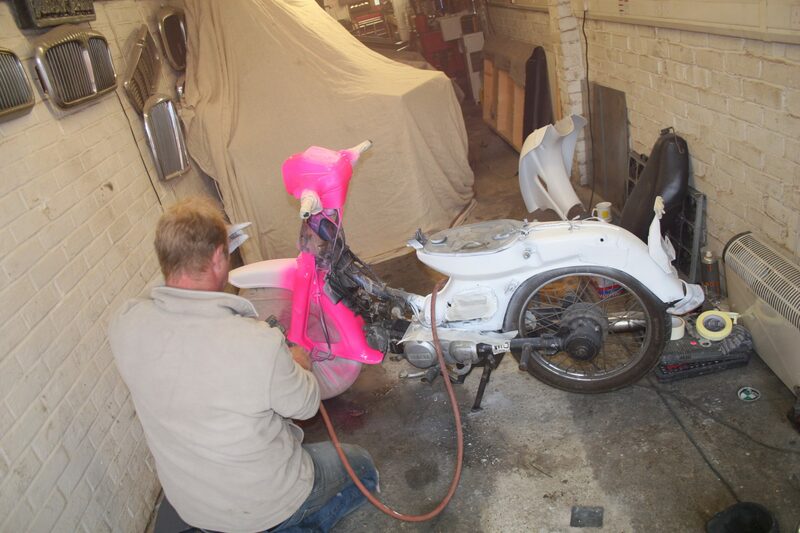 After a few minutes the bike was entirely stripped down (number plate removed). It was then prepared for painting (top layer of rust removed). Then the first squirt of pink was laid down. Spangletastic Pornstar Pink to be exact. Simultaneously everyone reached for their sunglasses and stood around nodding approvingly. It was truly hideous and abundantly clear that far from being invisible in the Sahara, the bike would actually be visible from space. We ran out of weekend and there was still work to do. Charlie ended up taking the bike home with him. Our next meet up would be for our pre-trip off-road training. A gruelling 6 hour endurance event at RAF Wittering. When we say “training”, we mean “twatting about”. The event was a “Mopedathon”. 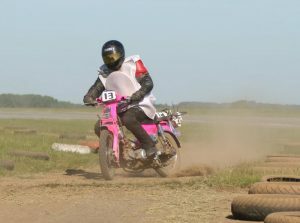 A 6 hour endurance race on mopeds, in fancy dress, and quite a lot of drinking afterwards. What is not to like. In keeping with our meticulous trip preparations, we had to resist trashing one of our Sahara-prepped bikes. Instead we would rely on a Honda Melody that had been festering in the garage at HQ for 3 years. According to Matt “it used to work”. That was reassurance enough for us. We’d got the bike going the day before the race. After a trip to the end of the drive and back it was declared that the bike had demonstrated full race capability. Unfortunately the Mopedathon racetrack is a tad longer than the drive. Long enough for us to realise that the Melody was incapable of reaching the manufacturer’s claimed top speed of 31 mph. Worse was to come. Charlie had brought Kaspars’ bike with him. It had now undergone a complete transformation from spare parts to “The Bike of Shame”.Matt was then due to take it back to HQ for storage until the trip. This presented a dilemma you see. Even the Bike of Shame was as fast as anything else out there and we couldn’t bloody ride it for fear of wrecking it just weeks before the trip. In order to put it beyond temptation we lent it to a race marshal so that they could use it as a safety bike for removing objects from the track. Like mudguards and bodies and stuff. We looked on in a huff as every other team bombed around having a laugh while we stood despondently looking at our asthmatic Honda Melody. It was no longer just slow. It refused to start. In times of despair a cup of tea is in order. We rustled up a brew and sat down to watch the race. This brightened our spirits. In what other motorsport event can you watch King King take out Wonder Woman on a hairpin bend. In the distance a pink thing that was merrily bouncing along was now lying amidst a cloud of slowly rising dust. It looked like a Tellytubby had been taken down by sniper fire. There was general hilarity and shouts of “someone’s binned it”. 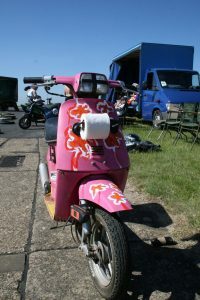 We gleefully joined in the piss-taking until it transpired one of the marshals had binned Kaspars freshly painted bike. Unbelievable. It would have been bad enough if we’d crashed it ourselves but this was even more galling. We were deflated once again and not at all looking forward to the awkward conversation that was about to happen. The marshal walked sheepishly towards us, pushing the bike with a bowed head. At least the wheels were going round. We did mental calculations of the crash damage but the closer it got, the better the bike looked. The rack that Charlie had fitted over the front mudguard to hold a tent and sleeping bag had taken the brunt of the crash and the paintwork was untouched. We were so deliriously happy that we immediately celebrated by removing all the bodywork from the bike and ragging the arse end out of it for the remaining 5 hours of the race. All it needed afterwards was new forks, a new rear brake pedal and a new set of handlebar grips. We didn’t tell Kaspars.